The landscape surrounding the James Dalton Highway is a real winter wonderland after fresh snow fall. Animal tracks as well as human footprints are easy to see in the crunchy snow. The James Dalton Highway, which is also known as the Haul Road, is mostly used by large trucks transporting supplies to the various stations along the Trans-Alaska Oil Pipeline. During the winter it is a treacherous drive but very rewarding for photography. 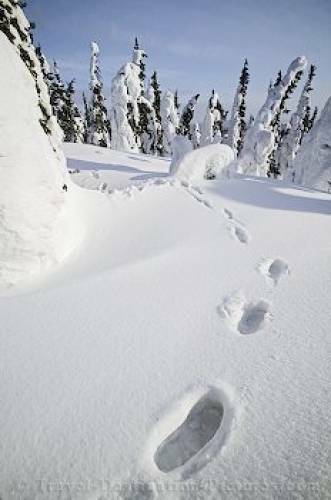 Snow covered trees and footprints, James Dalton Highway, Alaska, USA. into a forest along the James Dalton Highway.